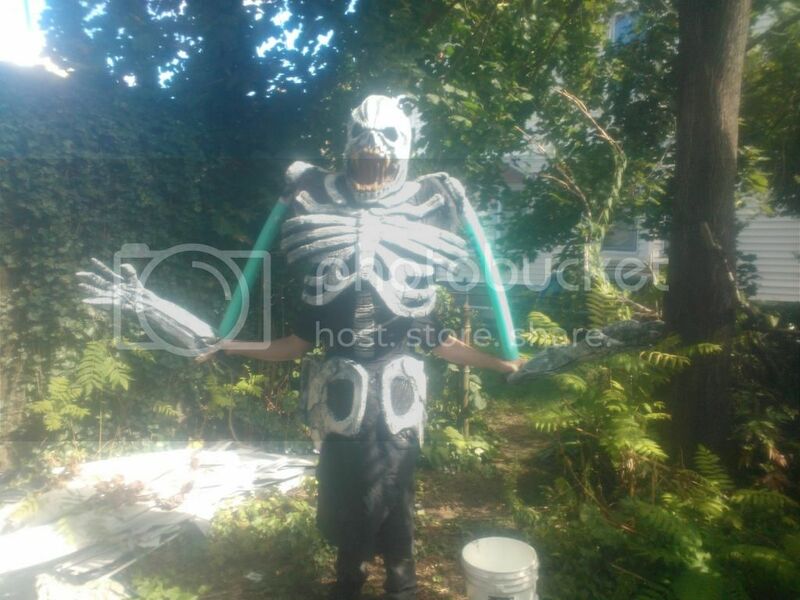 SO, for an upcoming event we need to make a large skeleton (aiming for 15-20 feet tall). I've looked into a few different ways ranging from stilts and a harness to a long pole with the skeleton being simply painted on a banner. It needs to be mobile, lightweight and able to take some hits from larp safe weapons. At this point I'm leaning towards the stilts harness with eva foam to create the limbs and head. 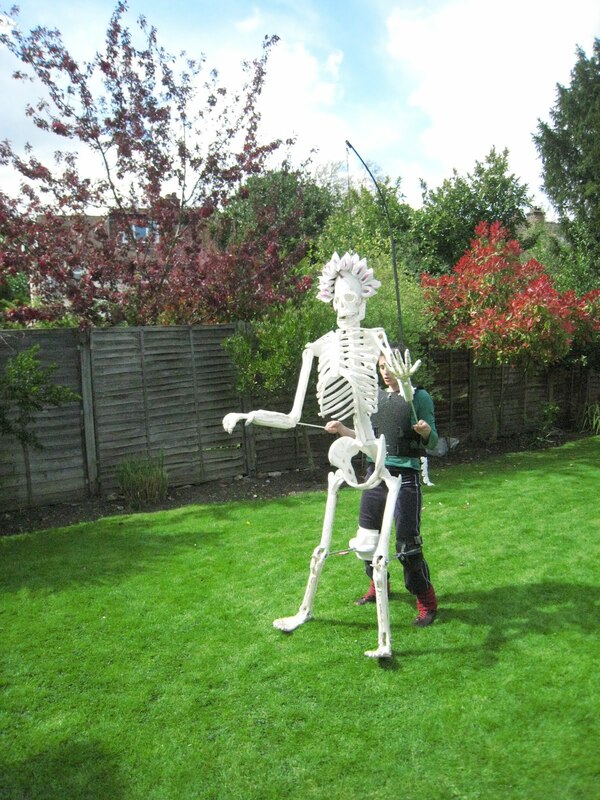 There are a lot of carnival style skeletons out there which may provide you with some design inspiration. They are basically a large rod puppet attached to the performer. If it needs to take hits, keep in mind how that may impact the balance of a stilt performer. Walking on stilts while carrying the weight of a large creature suit is difficult enough, but adding LARP style combat may be overwhelming for the performer, especially if hit from behind. If the structure is intended to take impacts, you may want to make it out of something that is not only light weight but flexible. For example L200 foam. Thin rigid structures (bones) would likely bend or break under impact, even with LARP weapons. If possible I would try to keep your performer on the ground (dressed in black or in a black morph suit) with the skeleton above them. Also keep in mind that creature performers need regular breaks, hydration, and often support staff to help them in and out of the suit. In a LARP environment (if that is your goal) this may be an additional challenge. But depending on your performance needs and the nature of the weapon hits you may be abel to pull it off with a skilled stilt performer. I'm excited to see what you come up with, and hope you can share the final product or build progress here. This is what I have so far. Got a few days to finish fabricating all the bones and paint it. Looking great, that's one big character! I love the head, it's down right terrifying. Pic of me at the event with our stiltwalker Eric in the suit. Got a back to back weekend event so I'll try and fix it up some this week. Legs need a little more work and going to add a couple straps to the stils so they are more comfortable.